Frank (Freddie) Alexander, 67, retired engineer from Portpatrick. Having previously walked the West Highland Way, Southern Upland Way and the Cape Wrath Trail I took an interest in the IATS when I read the article on Cotton Joe, in conjunction with the Rotary Clubs, opening up the trail in October 2013. He started at the Mull of Galloway and rather than emulate him, I decided to walk North to South and as far as I know, we are the only two that has completed it. I spent 25 walking days, two storm-bound days and three rest/organisation days on it. I guess a lot of other hikers can’t afford the time to do it, I only met two other hikers doing the CWT and several others doing short sections of it. I arrived at Durness early afternoon to find the ferryman, John Morrison, mooring up his boat, asked him if I would get across the Kyle today and he said he would be back around 5pm to take me as he had to bring some people back. 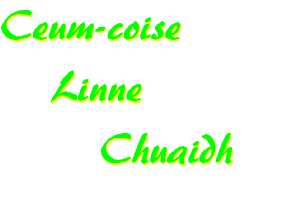 He advised that I would probably have to walk to Cape Wrath as the minibus wouldn’t operate unless there was four or more passengers. An hour or so later, six men arrived from Fife on a stag weekend, the bridegroom-to-be was adamant that his stag party couldn’t start unless it was from the Cape. This made seven of us and the likelihood that the bus would run! Later on a couple arrived from Edinburgh, as soon as the man starting speaking to me, I recognised him. I hadn’t seen him since 1978 when he was my superviser from Nuclear Enterprises in Edinburgh, the company that designed the Diasonograph (pregnancy scanning machine). He was intrigued with the walk I was about to undertake, never been to the Cape and was eager to see it. There was nine of us and the bus was definitely running. I had travelled from Portpatrick, overnighting in Inverness and after nearly thirty hours travelling, didn’t fancy the 11 mile walk to the Cape. Tea and cake from John Ure in the Ozone café at the lighthouse, they spent an hour exploring the area and taking photographs before I bid them farewell and spent a lovely evening on my own. The next morning I set off and before I even got to the Highland Hermit’s bothy at Strathchailleach the rain came on. This set the pattern for the rest of the walk, the worst May I can remember and the worst conditions I’ve ever walked in. The tracks were like streams and the terrain boggy. All the rivers were in spate and very hazardous to cross. Unlike the other trails, they don’t have bridges across rivers except for the two at the bottom of the Falls of Glomach which was a slippery and muddy climb. Apparently the most magnificent waterfall in Britain! Only the last two days, Ballantrae – Stranraer – Mull of Galloway did the weather settle and it was a pleasure to walk the Mull of Galloway Trail. I had intended to walk the route that the Hermit took from his bothy to the shop each week, London Stores at Badcall but the terrain was too boggy. 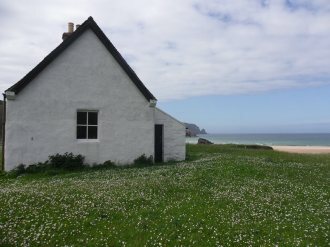 Instead I headed for Sandwood Bay. I had walked the CWT the previous year (14 days, 4 hours of rain, this year 14 days, 12 days of rain) South to North and split in into four sections, Cape Wrath to Inchnadamph to Kinlochewe to Shiel Bridge and finally to Fort William, picking up a foodbox at each place. It’s a burden carrying all your food so I mail these boxes out and only have to carry four days food at a time. When carrying 20kg “monster” rucksack for long distances it is purgatory and the heaviest item is food. Walking from Inverlael into Shenavall Bothy on the first Saturday out, I met a hiker on the Scottish National Trail, in his 4th week from Kirk Yetholm to Cape Wrath (864km) and later on that day, when walking the path into the bothy the weather really turned nasty, high winds and hail storm, so bad that I couldn’t focus my eyes and was blown off the track several times. I met a man propped up against a huge boulder taking cover and told him I would see him in the bothy. All the other walkers I met on the track were coming off An Teallach as they couldn’t even get on to Sgurr Fiona, the first Munro of the two. On entering the bothy I mentioned to the man already there that that was the worst weather I had ever walked in. The second man came in some time later and made the same comment to me, it turned out he was a 7-summiter, James Ogilvie, after climbing Mount Everest in 2007 he had climbed Mount Vinson in Antarctica this January to complete the highest peaks on all the continents. Very much a celebrity in the climbing/hiking world it was strange to hear him say the same, he had walked in minus 28 degrees and climbed when his body had almost shut down on Everest. With 25 Munros left he was in to do the Fisherfield Round of five Munros, needless to say, he didn’t get them ticked off as the weather overnight was very stormy and the conditions poor the next day. This was my first weatherbound day and once he was encouraged to, it was interesting to listen to him talk. He had a book coming out that week, Getting High – A World at My Feet.I had walked the CWT the previous year (14 days, 4 hours of rain, this year 14 days, 12 days of rain) South to North and split in into four sections, Cape Wrath to Inchnadamph to Kinlochewe to Shiel Bridge and finally to Fort William, picking up a foodbox at each place. It’s a burden carrying all your food so I mail these boxes out and only have to carry four days food at a time. When carrying 20kg “monster” rucksack for long distances it is purgatory and the heaviest item is food. Walking from Inverlael into Shenavall Bothy on the first Saturday out, I met a hiker on the Scottish National Trail, in his 4th week from Kirk Yetholm to Cape Wrath (864km) and later on that day, when walking the path into the bothy the weather really turned nasty, high winds and hail storm, so bad that I couldn’t focus my eyes and was blown off the track several times. I met a man propped up against a huge boulder taking cover and told him I would see him in the bothy. All the other walkers I met on the track were coming off An Teallach as they couldn’t even get on to Sgurr Fiona, the first Munro of the two. On entering the bothy I mentioned to the man already there that that was the worst weather I had ever walked in. The second man came in some time later and made the same comment to me, it turned out he was a 7-summiter, James Ogilvie, after climbing Mount Everest in 2007 he had climbed Mount Vinson in Antarctica this January to complete the highest peaks on all the continents. Very much a celebrity in the climbing/hiking world it was strange to hear him say the same, he had walked in minus 28 degrees and climbed when his body had almost shut down on Everest. With 25 Munros left he was in to do the Fisherfield Round of five Munros, needless to say, he didn’t get them ticked off as the weather overnight was very stormy and the conditions poor the next day. This was my first weatherbound day and once he was encouraged to, it was interesting to listen to him talk. He had a book coming out that week, Getting High – A World at My Feet. The last section of the CWT took me through Glen Barrisdale, quite a familiar place for me from climbing the Munros in there. 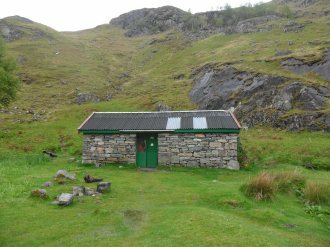 The first time I was the CWT last year, I came out of Sourlie’s Bothy in Knoydart with a fellow hiker. It rained all day and I noticed he was struggling, when it came to crossing the stream to get on to the path down to Barrisdale Bothy he wouldn’t cross it because of the flow. There was no other way to cross so I ended staying all night with him in the rain before raising the helicopter to airlift him to Broadford Hospital on Skye the next morning. It was a 10 mile walk to Inverie but before I got there I got help in calling out the Rescue Service from an American on the CWT, Rick Bondaci. He had walked the 2,400 mile Appalachian Trail and 800 mile “Walking the Line” between British Colombia and Alberta in the Canada. Because I lost some equipment in this incident, I had to come off trail, come back home, restock and start again. I met up with him at Inchnadamph three weeks later, walked with him to his finish at Cape Wrath, travelled back to the start at Fort William and hiked to Inchnadaph to complete. On reaching Camasnagaul and the ferry over to Fort William I had completed the CWT and the first section of the IATS. I took a day off in Fort William and organised hostels on the West Highland Way and rucksack courier, A2B Travel-lite, an excellent service based in Milngavie. 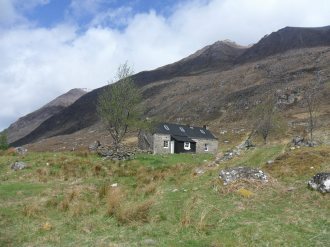 Although the weather was still poor, I was now on well-trodden tracks, no monster on my back and with overnight stays in good (most nights on the CWT were spent in bothies or huts) hostels in Kinlochleven, Tyndrum & Rowardennan I spent 3½ days on the WHW. Now I was meeting dozens of walkers going in the opposite direction whereas on the CWT, I went days without seeing anyone! Having walked the WHW before and with no navigation to do, it was all so much easier. After my second weatherbound day in Glasgow, I organised the next section of the walk, the Clyde Coastal Path. Only opened around the time of Cotton Joe’s walk, it starts at Milngavie and ends at Skelmorlie. Again the weather was poor and the moorland part very boggy and difficult to walk, most of it is path alongside the coast, crossing the Erskine Bridge then following the River Clyde along Langbank, Port Glasgow, Greenock, Gourock and Inverkip. Carrying “monster” again, I camped overnight in Port Glasgow. I had carried my tent from Cape Wrath and only started using it on the CCP because there is no hostels or bothies. On the whole of the CCP I didn’t meet any other hikers on my route. The fourth section of the IATS is the 100 mile route along the Ayrshire Coastal Path spanning from Skelmorlie to Glenapp, taking in Largs, Ardrossan, Irvine, Troon, Ayr, Dunure, Maidens, Girvan and Ballantrae. Again the weather was poor but at last I started to enjoy the walk because it was along beaches and coastline, entirely different to the CCP where it was a path alongside roads. Although well sign-posted the route was made easier when the tide was out, I could walk along stretches of beach and only joining the path when there was no tidal access. Overnighting in Fairlie, Troon, Maidens and Ballantrae the latter section was very difficult due to high winds and rain. Sand was being blown up on the beach and it was very slow progress that day. I met only one other hiker on the ACP, being blown along in the other direction! I was shown at lot of kindness on the hike, particularly in Inverlael, Troon and Ballantrae and Stranraer. People were aware of the conditions I had walked in on the day and invited me in to stay rather than camping out in the rain, but on the section between Saltcoats and Irvine where I wanted to take the direct route across the beach, I unmistakenly walked in to a Traveller’s site at Stevenson, if it hadn’t been for three young people nearby, I would have had my rucksack taken away and that would have been the end of my hike! It was the one and only incident but a scary one. I walked a little way with the three of them before taking the longer route round by Kilwinning. Ballantrae was the turning point, the weather came good, at last! I picked up the Mull of Galloway Trail at Glenapp, it was well marked out trail and the conditions were good. When I got to Cairnryan it felt like I was nearing the end of a long tough walk, the walk to Stranraer felt good and I was nearly home. Last day from Stranraer to Mull of Galloway was a beautiful day, started at 0430 and got there at 1330 expecting to walk back to Drummore to catch a bus home. Enjoyed this section most, not only because of the conditions but it is very scenic route and the end was in sight! I didn’t meet any others in the two days of this trail. At the lighthouse, the Mull of Galloway Lighthouse Trust took a keen interest in what I had just completed, requested I do this report and gave me a lift back to Drummore. The pamphlet on the Mull of Galloway Trail describes the route in both directions and another reason why I enjoyed this section. Walking North to South, everything seems against you, the prevailing SW wind, all the maps are set upside down and the books have to be read back to front. Since completing the walk, I was invited to take part it two charity events. One being, 60 mile in 30 hours between Glasgow and Edinburgh, the other being the MacMillan Mull of Galloway walk back to Stranraer. I walked the IATS at probably the worst time possible but it was my intention to get back for a pre-arranged event in Portpatrick and unfortunately both walks coincide with this. 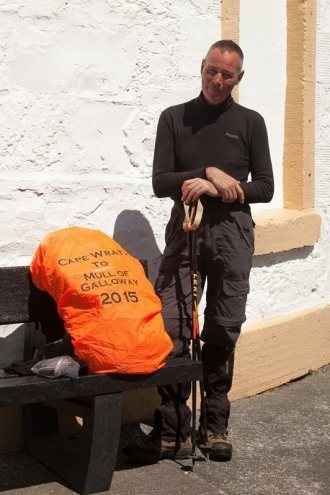 Frank left Cape Wrath 2015 May 10 and arrived at the Mull of Galloway 2015 June 9. He had 25 walking days in the worst May he can remember.